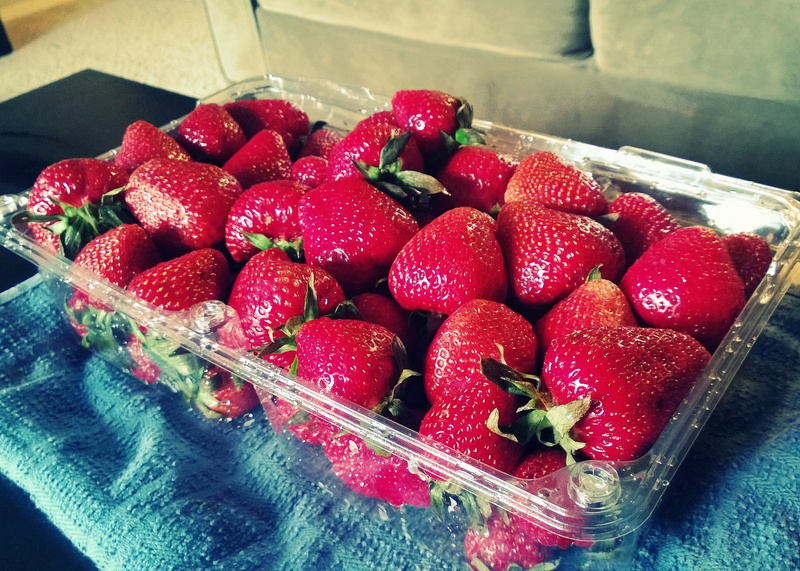 I love strawberries. Who doesn’t? But something about strawberry jam has always put me off. After making my own strawberry purees for serving with Pavlovas or Banana cakes (etc), I have come to realise why. I don’t like the sickly sweet taste that comes along with store-bought strawberry jam. Which is strange, as I have always considered myself a sweet tooth. For those of us with fructose malabsorption, it’s not just the calories that we need to watch out for with high sugar foods and spreads – it’s the fructose load. Even though it might be castor sugar that has been used, which has 1:1 fructose/glucose ratio, the co-transport method of absorbing fructose can be eventually overwhelmed and symptoms would still ensue. You can buy “no added sugar” jams at the supermarket and find recipes online but I find that they add either very large amounts of artificial sweeteners like Splenda or fruit juices – well, that’s still adding sugar to me… and even worse, it’s usually apple or grape juice. So, after struggling to find a recipe that would work for me, I decided to make my own. And here it is. It is sweet enough to satisfy a sugar craving but it wont add many calories to your daily intake or unnecessary fructose to your fructose load. I have linked instructions on how to preserve acidic foods, however I found that the freshness of mine lasted approximately 3 months before they began to go south. I have a couple of theories as to why. Firstly, I stored mine on the shelf above the fridge, not realising how hot it got above there, which clearly wasn’t storing it in a cool place, no matter how dark it was. 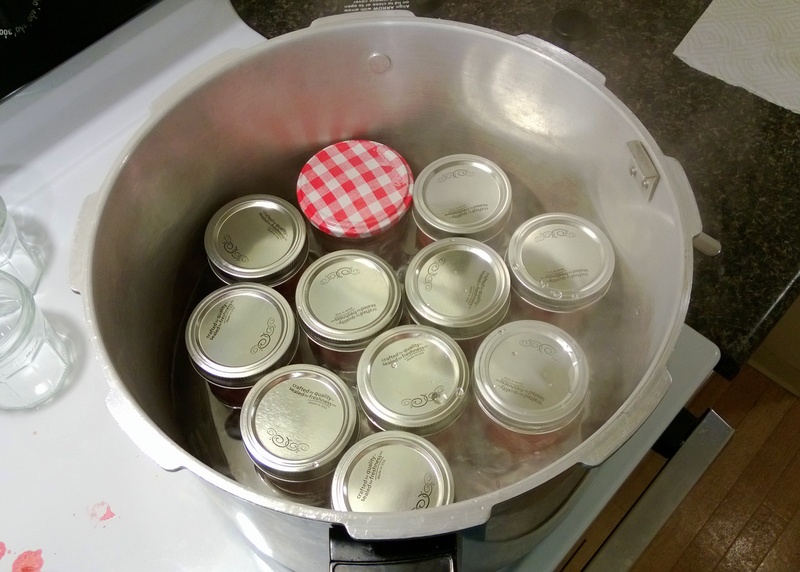 Secondly, sugar helps to reduce the water available for any flora present to use for metabolic processes; the fact that I didn’t add any sugar means that, even though I pressure canned these jams, one line of defense was gone. While I think that it was more likely the warm storage area, rather than the reduced sugar, that is the culprit, I will most likely make this as a freezer jam recipe in the future… just to be safe. Strawberries are low in FODMAPs, thus safe to eat. 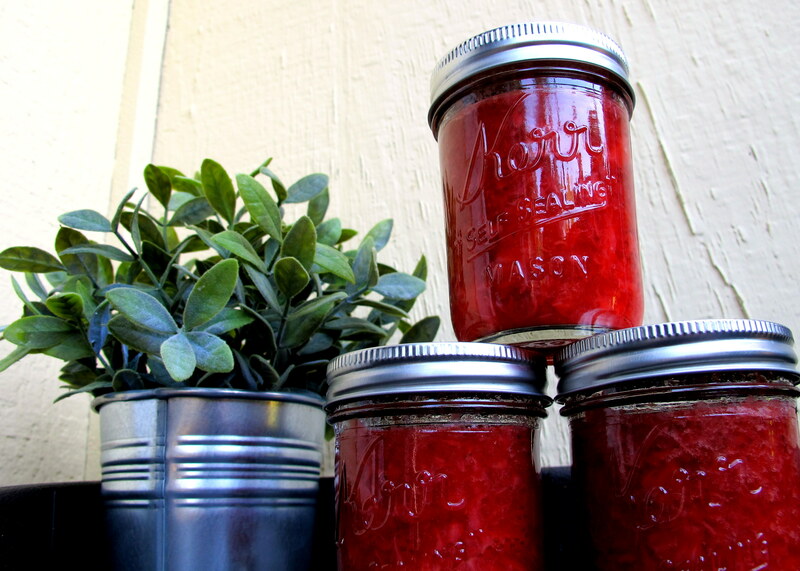 Makes 10 x 240 ml/half pint jars with a little bit left over. It comes in at a whopping 2 calories per tablespoon serving! I used http://www.caloriecount.com to work this out. If you are a desperate sweet tooth, you can still add sugar/glucose to this but I can’t see it needing more than 1/2 a cup, to my taste. 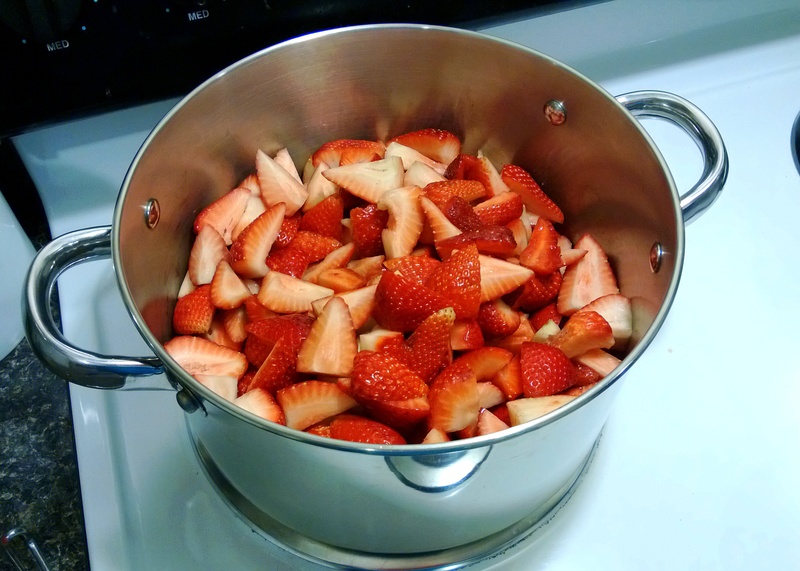 Remove the stalks from all the strawberries. This is very mundane. Sorry. As you can see, I took myself to the couch and did it while watching Doctor Who. Much better. Slice strawberries into quarters or there about. Grate the rind from the lemon and then squeeze it til the juice has all been removed. Top the lemon juice up with water until it measures 1 cup. 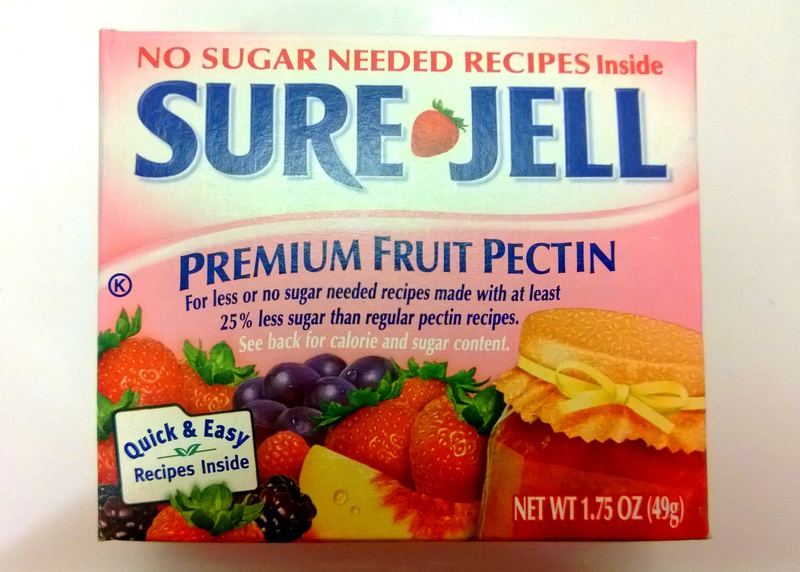 The “Less or No Sugar” pectin is important. If you get regular pectin, it won’t set properly without the exorbitant amounts of sugar required for traditional jam recipes. Combine all ingredients in the saucepan and bring to the boil. Using a spoon, remove the frothy scum from the top; this gives jam an unpleasant texture and a slightly bitter taste when it has set at the tops of jars. Discard it. 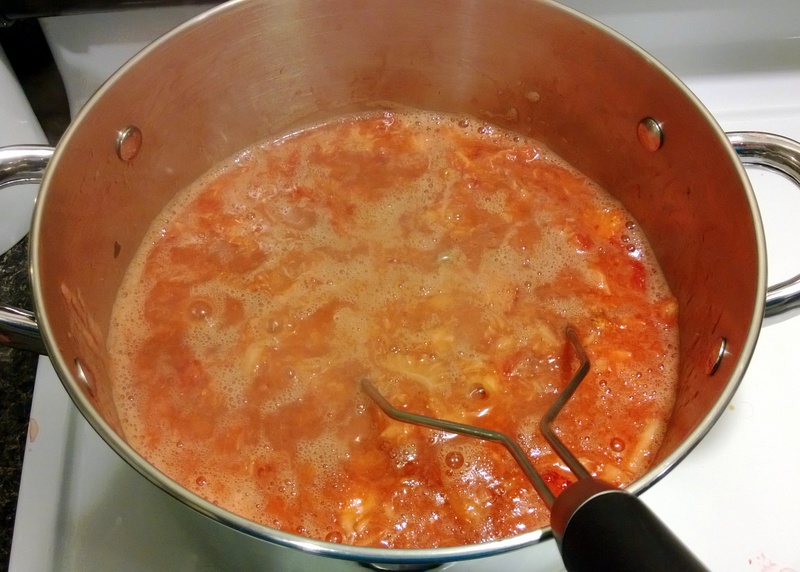 Let the jam simmer for 15 minutes, removing more froth as necessary. Follow the instructions for preserving acidic foods. Use a wide-mouthed funnel to fill sterilised jars, leaving 2 cm space at the top. After removing air bubbles, wipe rims and place on lids and rings. Place jars back in the simmering water to keep the glass hot before processing. The above linked instructions will demonstrate how to water-bath can the jars. Process for 15 minutes and then let cool for 10 minutes in the water before removing to cool completely on a wire rack – approx 12 hours. After 12 hours, test the seals with a magnet, if they do not pass then either re-process or refrigerate/freeze immediately. This jam is great spread on toast, muffins and banana cakes; with yoghurt and some slivered almonds; or used in smoothies to add a strawberry flavour. Or with a Devonshire Tea. Done. I’ve just decided what I’m making next time I want dessert. It is just sweet enough to satisfy a sugar craving but isn’t going to ruin your carbohydrate or calorie count for the day if you’re being careful. There is just a slight hint of the lemon flavour; not overwhelming but it gives it some interest. Yummo! 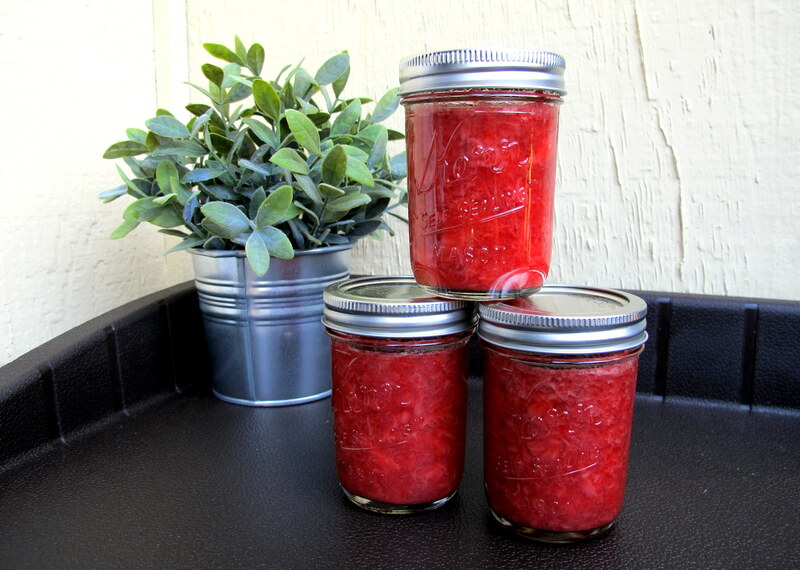 This entry was posted in Breakfast and tagged berries, canning, FODMAPS, food, fructose friendly, fructose malabsorption, fruit, gluten free, healthy, home-cooked, homemade, jam, jelly, lemon, lemon rind, lemon zest, low fat, low fructose, low sugar, no added sugar, preserves, spreads, strawberry, sweet, vegetarian. Bookmark the permalink.